The Vastu Purusha is the presiding deity of each and every plot whether it is big or small. He has a fixed and peculiar body. His head remains hanging down and his body is spread all over the length and breadth of the ground. He is depicted as lying with the head in the northeast and legs in the southwest. There is an interesting story in the Matsya Purana in which the birth of Vaastu Purusha is narrated. In the early ages Lord Mahadev (Shiva) was at fierce war with a Rakshasa (demon) named Andhakasur. This war continued for years and Lord Siva killed devil Andhikasur,. In an encounter Lord Shiva became tired and exhausted, and he began to sweat profusely. 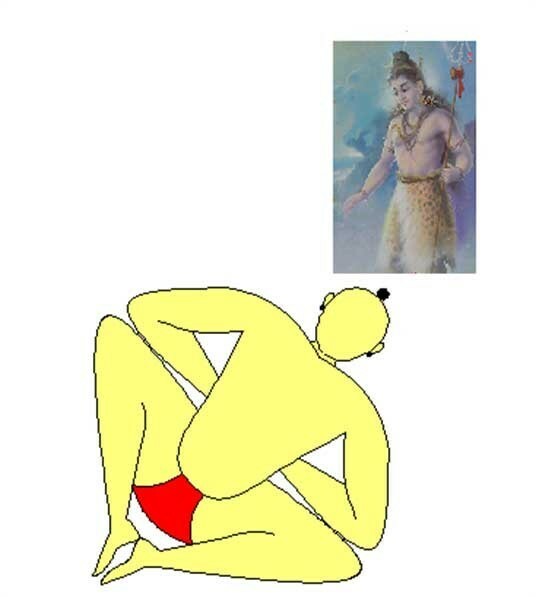 The sweat of his brow fell down and from it raised a huge Bhuta (Great Spirit Vaastu). He looked very cruel and drank all the blood from the body of Andhakasura and yet his hunger was not satisfied. The Bhuta made penance and Lord Siva was pleased with his penance and granted him boon which was that he should have capacity to swallow all the three worlds. He got possession of all the three worlds and was about to eat men and animals of the terrestrial world. The celestial beings, Brahma, Shiva, and the Asuras were terrified by this .They went to Lord Bramha. Lord Bramha asked them to lay the spirit face down. And they (the Forty-five deities) encircled and caught hold of the devotee ( Bhuta) pressed him down and sat on different parts of the back. Bhuta became helpless and admitted defeat but begged for some provision for his sustenance. According to Dharma Satra , When the spirit begged for forgiveness from Lord Bramha, Lord Brahma blessed him and granted Lordship over the site of buildings and said that he would be the deity of all the plots and constructions, and offerings (Balibhog )should be made as a duty to this daily twice-born deity at the end of all sacrifices prescribed to all The Devatas. In return Vastu Purusha is said to be taking care of the inmates for pleasures and prosperity of the building. Ever since then this Devotee has been lying down in that position. It was also ordained that he should be propitiated along with the Devatas and Asuras over the body before any construction, and in default of such propitiation. However, those who start living without Vaastu Devtas prayers and offerings, he can trouble them and may swallow the fruit of meritorious deeds of the owner or occupier of the building. Vastu-puja is therefore imperative for the prosperity of the owner and those live in the place. This and many other such myths and fables can be found in different Puranas. Probably these stories were included to make people conscious about the subject which would make them build their house as per Vaastu Shaastra.